So our new focus during our reading extension time is nonsense words. We are trying to get the kids ready for their next DIBELS benchmark and of course for progress monitoring. I can say that I do enjoy doing something a little different, but it is taking so much of my time gathering and making all of these new materials. I love the stuff I am finding though! I even made some of my own! 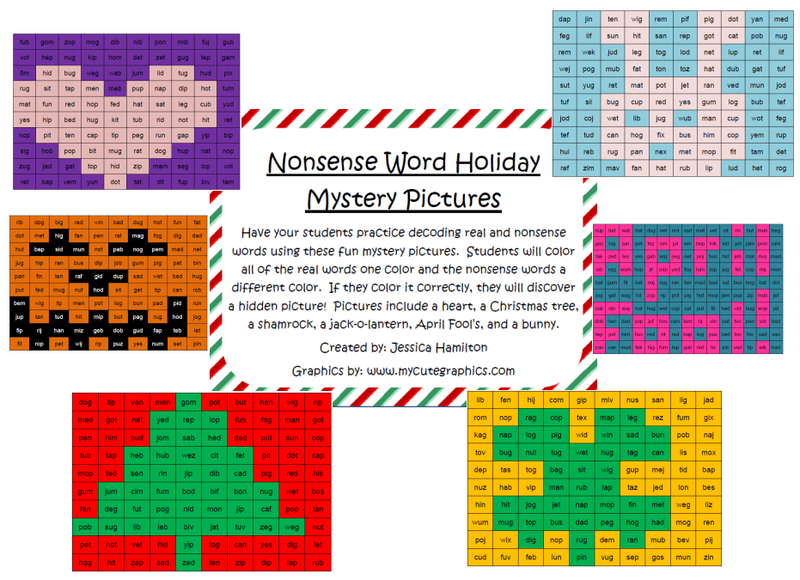 These are my nonsense word hidden pictures. Basically, the kids read each word and decide if it is real or nonsense. If it is real, they color it one color and if it is nonsense, a different color. The end result: a hidden picture! I have one set that is just basic pictures and another set that is holiday pictures. You can pick them up here!